TASK FORCE DELTA Continual training and vigilance are the pillars of counterterrorism. Shuttered sometime the previous night, the Detroit-area staple that introduced so many to Middle Eastern cuisine appeared to be a victim of overextended credit or poor management. In actuality, due in large part to far more troubling circumstances, La Shish’s demise had been mounting for nearly two years. Widely believed by law enforcement to be enjoying safe haven in his native Lebanon since a May 2006 federal indictment on tax evasion, La Shish owner Talal Chahine remained at large on the day his restaurant chain of nearly 20 years unceremoniously ceased operations, abruptly leaving some 300 employees jobless. Alleged by federal authorities to have skimmed some $20 million from the La Shish enterprise, the most damning accusations levied against Chahine had much more to do with a purported association he kept. Identified in federal court papers in May 2006 as having been a keynote speaker at a 2002 fundraising event in Lebanon for Hezbollah, Chahine is suspected to have routed funds to the group — whom the U.S. government considers a terrorist organization — through third-party couriers. Though Chahine won’t likely return to the United States to face charges, disrupting terrorism funding represents just one piece of a wide spectrum of threats that have emerged in metro Detroit since the terrorist attacks against New York and Washington on Sept. 11, 2001. No longer confronted by traditional warfare, federal agents say money-laundering is part of a growing list of terrorist activities targeted against metro Detroit, one of the nation’s most vital intelligence centers. The threats include strategic cyber-attacks on vital R&D operations, the disruption of communication networks, bio-terrorism, freshwater contamination, chemical spills, assaults on nuclear power facilities, a refinery disaster, or even crude bombs designed to inflict catastrophic damage on urban centers and landmark structures. It’s no wonder that Andrew Arena continues to make the case that the “threat is still very real,” well over a year into his appointment as the special agent in charge of the FBI’s Detroit division. Unfazed in his pursuit, Arena, 46, a 20-year FBI veteran who, despite the high-stakes nature of his position, could pass for someone nearly half his age, ran the international-terrorism operations section at FBI headquarters in Washington, D.C., before taking over the Detroit division. He attributes some of the skepticism he encounters during FBI outreach efforts to the relative sense of calm that has largely prevailed in America since 9/11. Nevertheless, Arena, a University of Detroit Law School graduate, benefits from both a hometown advantage of being familiar with the region’s landscape and a career full of experience spent working counterintelligence and counterterrorism. According to Arena, changes implemented by the FBI after 9/11 have greatly contributed to maintaining public safety and the protection of vital operations like the Ambassador Bridge, Detroit Metropolitan Airport, the Detroit Branch of the Federal Reserve Bank of Chicago, the headquarters and research operations of the Detroit Three automakers and their suppliers, and numerous other high-profile facilities like financial institutions, sports arenas, and entertainment venues. Because of security measures, Arena declined to address the FBI Detroit division’s operational budget, investigative methods, or even the exact number of agents assigned to counterintelligence and counterterrorism from the 250+ agents he leads. But Arena, who oversees 11 FBI satellite offices throughout Michigan, did address the department’s 24/7 response capability that has emerged from a relatively new joint terrorism task force. Composed of more than 70 investigators representing federal, state, and local law-enforcement agencies, the task force is capable of being “dispatched anytime, day or night,” Arena says. Familiar with task-force implementation from his tenure at FBI headquarters, Arena routinely interacts with and makes “no distinction between” agents from Alcohol, Tobacco, and Firearms; Immigration and Customs Enforcement; Department of Homeland Security; and local law-enforcement municipalities. According to Arena, the task force responds to incidents at Detroit Metro and the Ambassador Bridge on an almost daily basis. The potential threats include suspects believed to be monitoring air or road traffic from parked vehicles, boats that come too close to the bridge’s support piers, passengers and motorists who arrive without passports or green cards, laser lights pointed at airplanes, and suspicious trucks parked next to or near security zones. Forecasting a potential terrorist attack or predicting the financial ramifications of a successful act of terrorism isn’t easy. For example, a chemical spill that contaminated the Detroit River would affect water distribution to businesses and residents in southeast Michigan and southwest Ontario. Unfortunately, tragedy does provide the best barometer of the economic damage that could potentially be left in its wake. According to a New York comptroller report completed a year after 9/11, the destruction of buildings in the vicinity of the World Trade Center and the lost earnings of those who ultimately perished was assessed at $30.5 billion. Property loss and damage was assessed at $21.8 billion. Estimated to stretch out over a three-year period, the total economic impact of the World Trade Center attack ranged from $82.8 billion to $94.8 billion. Assigning an exact economic impact figure to metro Detroit using a hypothetical terrorism scenario is difficult. The severity of any terrorist act is the most accurate indicator of what its sustained impact will most likely be. When taking the area’s infrastructure into account, the economic damage experienced in the aftermath of a terrorist attack remotely comparable to the events experienced in New York and Washington would be in the billions. Detroit security expert James Marcinkowski, a former CIA operations officer who spent time in the FBI and naval intelligence, believes that even a slight disruption to local business resulting from terrorism could prove “devastating” to the region’s economy. He adds that many metro Detroit businesses, whether a large automaker or a chain of gourmet markets, are susceptible to terrorism’s financial reach. Marcinkowski, who consults many local companies on anti-terrorism, believes businesses can make themselves far less susceptible to terrorist threats by taking pre-emptive measures to protect their systems, review yearly plans, and educate their workforces. For systems, that includes the use of backups, off-site data storage, anti-virus software, and firewalls. He advises all clients to have an emergency contingency plan in place that’s capable of being put into play at the onset of any terrorist act. Emergency plans should be detailed enough to include evacuation plans, as well as procedures for operating in the immediate aftermath of an attack. Lastly, Marcinkowski believes people have to be conscious of the fact that the face of terrorism is ever-changing. Today’s terrorist could just as easily look like Osama bin Laden or like Oklahoma City bomber Timothy McVeigh. In fact, in addition to Islamic fundamentalists, there’s a growing fear in the counterterrorism community that some young disenfranchised Caucasian men have turned to al Qaida, according to Marcinkowski. Unfortunately, businesses, on the whole, aren’t doing nearly enough. “Businesses have a tendency not to put money toward maybes,” Marcinkowski says. “They may not be responsible for an occurrence [of terrorism], but will be for not being prepared. Not enough corporations are doing [contingency] planning.” Marcinkowski estimates that only 25 percent of the contingency plans he knows of are even effective. Daily planning to counter terrorism is, however, taking place in one of the most ambitious efforts the state has undertaken in recent memory. 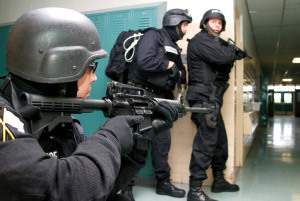 Put into play in December 2006, the Michigan Intelligence Operations Center (MIOC) combines representatives from the Michigan State Police, FBI, Department of Homeland Security, and local law-enforcement agencies under one roof to confront terror threats 24/7. One of 58 “fusion centers” currently operating around the country, the MIOC centralizes expertise inside its Lansing location to collect, evaluate, and analyze intelligence information. The MIOC operates under the direction of the Michigan State Police. Multi-agency participation allows raw information to be quickly turned into actionable intelligence. Establishing a response plan can take many forms, including questioning suspects, behavioral analysis, intelligence-gathering, background checks, undercover operations, cryptanalysis, and underwater surveillance. Plans call for a similar center in metro Detroit once all of the logistical matters can be worked out. Government safeguards like the MIOC cannot fully address terrorism on their own. “We can’t do it all ourselves,” says Arena, who welcomes the region’s “cottage industry” of private industry players willing to either initialize or reconstitute efforts at creating products to aid homeland security efforts. There’s also the unknown. One of the major differences between the hierarchy of a traditional mafia organization and a known terrorist network is the latter’s willingness to multiply into splinter groups. Particularly disconcerting for Arena is how technology has allowed an entire ideology to spread unabated. “You can go on a jihad Web site and be indoctrinated. You don’t even have to go to Afghanistan to train,” he says. But threats against vital computer data, for example, may result from actions closer to home. According to a recent study by Detroit-based Compuware Corp. and the Ponemon Institute, company insiders were the cause of most data breaches. Hackers ranked a distant fifth. The study also shows that 41 percent of all data breaches occurred in a mainframe environment, which stores a majority of the world’s corporate and governmental data. Judging by the threat matrixes he sees originating daily out of Washington, Arena offers caution for anyone choosing complacency over diligence. Conceding that the ultimate terrorist goal is still to attain and use nuclear and biological material, unsuccessful attempts to date at procuring either only strengthen the resolve of countless purveyors of terrorism, collectively known for their imagination and extreme patience. Pausing to lament on the seriousness of that particular threat, Arena says that no one should let his guard down. “That’s what keeps me up at night,” he says. Certain kinds of activities can indicate that terrorist plans are in the works, especially when they occur at or near high-profile sites or places where large numbers of people gather — like government buildings, military facilities, utilities, bus and train stations, and major public events. If you see or know about suspicious activities like the ones listed here, please report them immediately to the proper authorities. In the United States, that means the closest Joint Terrorist Task Force, located in an FBI field office. In metro Detroit, visit www.detroit.fbi.gov or call 313-965-2323. Surveillance: Are you aware of anyone video-recording or monitoring activities, taking notes, using cameras, maps, binoculars, etc., near key facilities or events? Suspicious Questioning: Are you aware of anyone attempting to gather information in person, by phone, mail, e-mail, etc., regarding a key facility or the people who work there? Tests of Security: Are you aware of any attempts to penetrate or test physical security or procedures at a key facility or event? uniforms, badges, flight manuals, access cards, or identification for a key facility or event or to legally obtain items under suspicious circumstances that could be used in a terrorist attack? Suspicious People: Are you aware of anyone who doesn’t appear to belong in the workplace, neighborhood, business establishment, or near a key facility or event? “Dry Runs”: Have you observed any behavior that appears to be in preparation for a terrorist act, such as mapping out routes, playing out scenarios with other people, monitoring key facilities or events, timing traffic lights or traffic flow, or other suspicious activities? Deploying Assets: Have you observed abandoned vehicles, stockpiling of suspicious materials, or suspicious people being deployed near a key facility or event? If you answered yes to any of the above, contact the Joint Terrorist Task Force or law-enforcement/counterterrorism agency closest to you immediately.